The debate over Seattle’s efforts to shut down unauthorized homeless encampments and help the people living in them is raging at City Hall and on the street. Thoun Sasouvanh wasn’t in his tent when police, a cleanup crew and outreach workers arrived to shut down the homeless encampment where he had been sleeping. By the time Sasouvanh returned to the stretch of sidewalk on Fourth Avenue under the Yesler Way Bridge in downtown Seattle, the crew had been working for a while. Someone had gathered his belongings into black garbage bags, which were laid out on the pavement for him. Sasouvanh said he had dealt with this before. Mayor Ed Murray and his aides say cleanups like the one Sasouvanh encountered Monday are necessary to maintain public health and are being carried out humanely. The unauthorized encampment on Fourth Avenue was blocking the sidewalk, said Scott Lindsay, the mayor’s public-safety adviser. But some advocates and City Council members have been pressing the Murray administration for more proof the cleanups aren’t doing harm rather than good by uprooting people without offering enough help. The advocates call the actions sweeps. The debate will continue Tuesday, when the council is scheduled to vote on whether to release an additional $2.3 million for Murray’s emergency response, and one or more council members may seek to restrict the cleanups in return for that cash. Meanwhile, something became clear as Sasouvanh contemplated his next move: The cleanups, like other efforts to deal with homelessness, can be complicated. Sasouvanh spoke with an outreach worker but wasn’t sure whether he would follow up with her. The Laotian immigrant also wasn’t sure where he would spend the night. Murray administration officials briefed the council on the cleanups Wednesday for the second time since November, when the mayor called a homelessness emergency and allocated $5 million in one-time money to boost shelter, services and outreach. The officials presented the results of 54 cleanups carried out from November through January: 293 people were counted, including 93 people who took advantage of nonshelter services and 90 who moved into shelters, with overlap between those groups. Some council members have criticized the city for moving less than 40 percent of people from cleanups into shelters. But that rate is higher than before November, Lindsay said, attributing the improvement to enhanced outreach. The council members aren’t getting the complete story, though. The 54 cleanups they heard about Wednesday involved only encampments with three or more tents. Since November, the city has carried out more than 40 cleanups of smaller encampments, according to Human Services Department records. The smaller cleanups aren’t covered by protocols requiring the city to provide outreach and advance notice to campers, and the Murray administration isn’t tracking those results. That worries Councilmember Lisa Herbold (District 1) and others who argue the same protocols and scrutiny should apply to all cleanups, large and small. Herbold also worries about how officials are deciding which encampments to clean up and when. Lindsay said the city is prioritizing large encampments associated with crime and public-health hazards for cleanups with enhanced outreach. He pointed to repeated cleanups above Interstate 5 near the Yesler Terrace public-housing project. Yesler Terrace residents had complained about encampments there. Seattle Housing Authority Executive Director Andrew Lofton, in a letter thanking Murray for the cleanups, blamed campers for threatening encounters and break-ins, people openly shooting up drugs, hypodermic needles and human feces scattered around, people stripping naked to bathe, and rats in mountains of garbage. Though the city isn’t required to provide outreach and advance notice at smaller encampments, it often does anyway, added Jason Johnson, deputy director of the Human Services Department. Those assurances aren’t enough for Herbold, who’s asked the Murray administration to make its cleanup schedules and criteria available for the public to read and critique. Some people are unable to move into shelters because they aren’t sober, have a pet, want to stay with a partner or lack identification. Some are unwilling because shelters can be crowded, dangerous and open only during the night. The city doesn’t have enough beds for everyone anyway, even after adding more than 200 since November. People moving into shelters from encampments may be pushing others out, said Lisa Daugaard, Public Defender Association policy director. Last month’s One Night Count found 2,942 people outside in Seattle. The city has about 1,800 shelter beds. That’s why Daugaard argues the city must add more beds while lowering barriers to shelters. “You won’t make net progress until you do both those things,” she said. 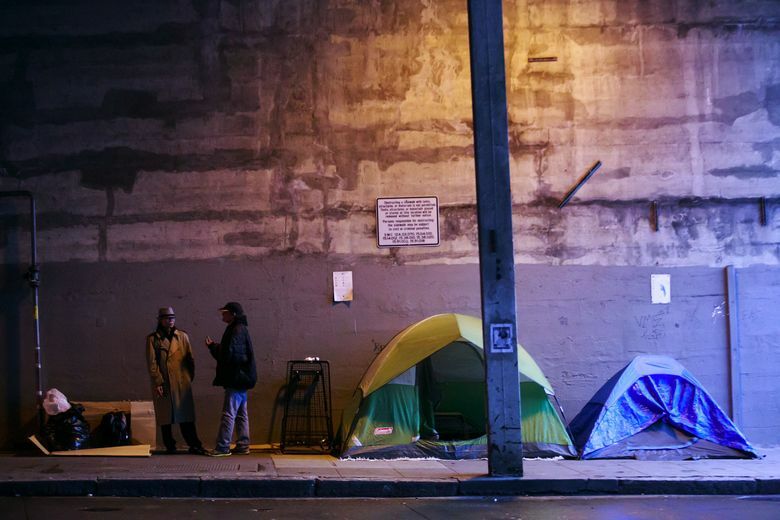 Councilmember Sally Bagshaw (District 7), who chairs the council’s human-services committee, said she is working on a plan: She wants to create more space for campers across the city, then clamp down further on unauthorized camping. The Murray administration opened authorized tent cities in Ballard and Interbay last year and may open a third soon near the Othello light-rail station in South Seattle. “We want to help everybody and we want our neighborhoods to be clean and healthy with people taking responsibility for themselves — both are true,” Bagshaw said. Though crews throw out trash, personal belongings are supposed to be held in storage for 60 days. But claiming an item isn’t simple. When a Seattle Times reporter called the city’s customer-service bureau about doing so, he was transferred to a Seattle Department of Transportation (SDOT) employee who couldn’t help him. Ten minutes later and still on hold, he hung up. The reporter subsequently received a phone call from the SDOT employee in charge of stored belongings, who said the items can be retrieved at 4200 Airport Way South from 7 a.m. to 3 p.m. on weekdays. That employee, Kenny Alcantara, said one or two campers per month show up to retrieve their belongings, but 95 percent of the items are trashed after 60 days. Police Sgt. Paul Gracy said he understands why some advocates and Councilmember Kshama Sawant, who has raised questions about tossed belongings, dislike the cleanups. But he said cops and the crews try to treat campers with respect. Gracy has made just one arrest after taking part in hundreds of cleanups, he said. Before moving along Monday, Sasouvanh shrugged off the potential loss of his tent. 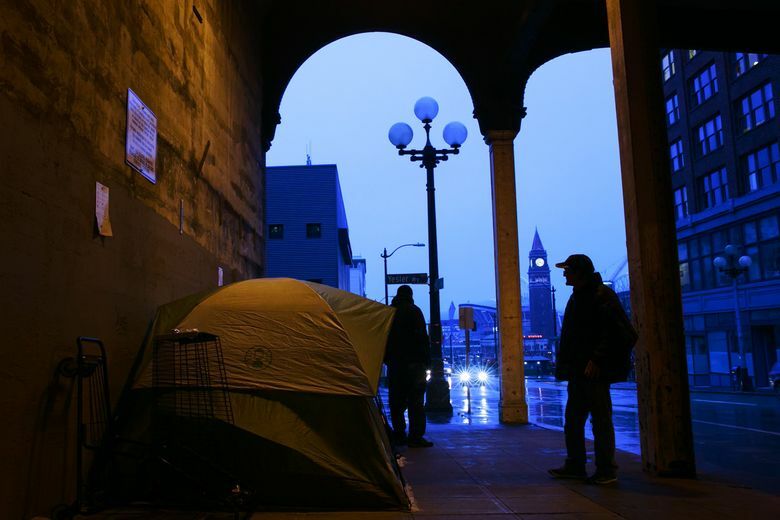 When a photographer came by on Thursday, campers had returned to the stretch under the Yesler Way Bridge — including Sasouvanh.